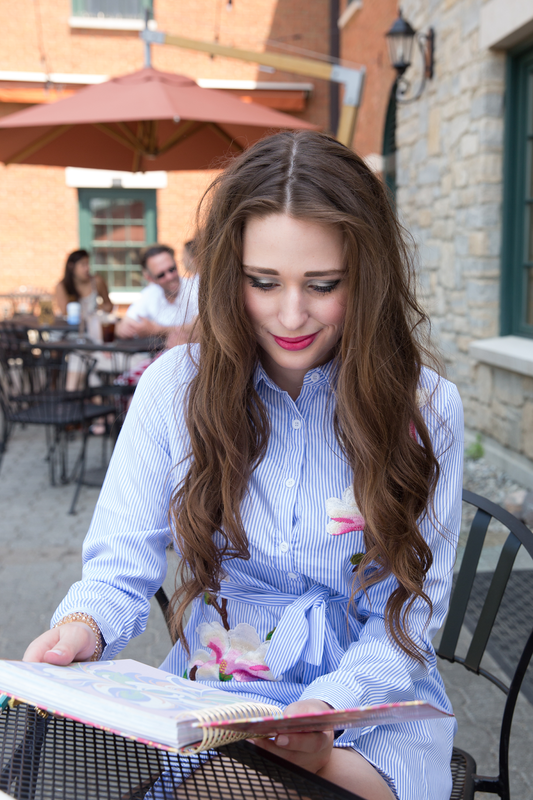 Today's post is in collaboration with Lauren James. This post also contains affiliate links. All opinions are honest and my own. Thank you for supporting Southern Belle in Training. In high school and college, I always relied heavily on my planner. (I've always preferred the term "planner" to "agenda" - personally!) I'm sure many of you are the same, since those years of schooling and extracurricular activities are a busy time of life for many. The actual planner that I was using changed somewhat over the years. In early high school I was very thrifty and just used the ones that my school gave all students- very bland small ones with a large ram emblem on the front (our school mascot was a ram). By the time I was a bit older, I had moved into my Vera Bradley obsession years, and used their planners for a couple years. And then of course began my love affair with Lilly Pulitzer, so I used a Lilly agenda for the rest of college and then broadcasting school. But with recently moving to Vermont to begin my new job and going through such a big life change for that, I started feeling unmotivated to use my old Lilly agenda! It still had all of the past year's info in it about my old life back in Charlotte, and it just didn't feel right to use it here in Vermont anymore. I tried going planner-less for a little bit, but between balancing my blog work and also all of the events that pop up in the summer for my day job, it was really time to get a new one. 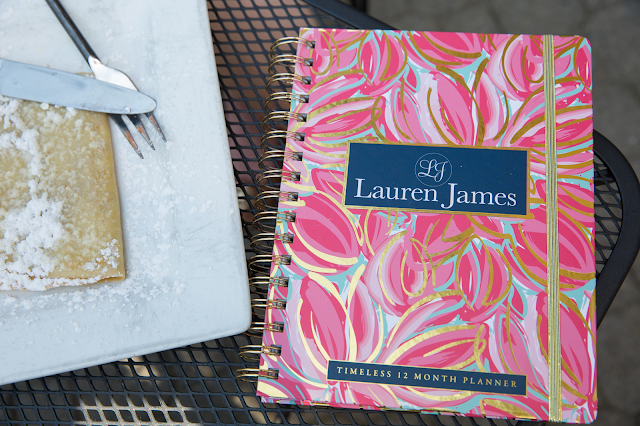 I was presented with the opportunity to review the brand new Lauren James Timeless 12 Month Planner, and honestly it couldn't have come at a better time, since I was already beginning to browse new planners! 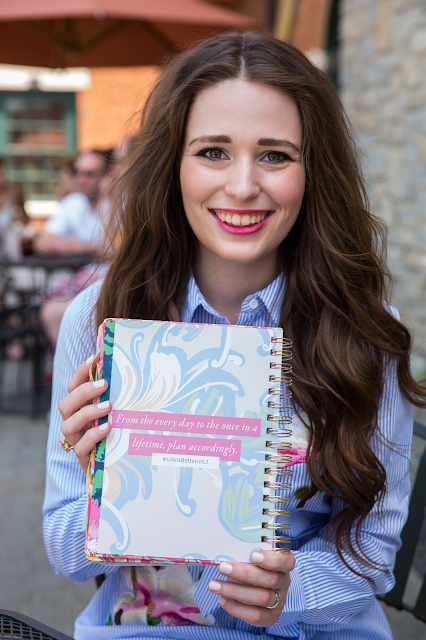 Lauren James has already been one of my go-to destinations for preppy apparel, and I was excited to see what their planner would look like. I knew as soon as I opened my package containing it that I would love it- because how beautiful is the design on the front?! One feature of the planner that I really like is the meal planning feature. I love cooking, and I'm also on a tight budget this year with an entry level job salary and paying off broadcasting school. So I have a strict grocery budget each week that I stick to, and with that comes holding myself to planning out what I'll cook in advance! If I fail to do that, it costs me (literally). So I know that I'll be taking advantage of this feature of the planner. I'm definitely excited to begin using my Lauren James Timeless 12 Month Planner soon, and I would recommend it for other post-grad ladies who might be looking for a new type of planner for new life changes! A side note on where these photos were taken- they were taken outside of the The Skinny Pancake, which is the best crepe restaurant in Burlington. One of my favorite bloggers, Caitlin from Southern Curls and Pearls, had traveled here a few times in the fall way before I moved here and had written a travel guide all about the area. She stressed that if there was any place to eat at in Vermont- this was IT! As soon as I accepted my job up here and knew I would be back in the area, I knew I had to try this place, and it didn't disappoint! 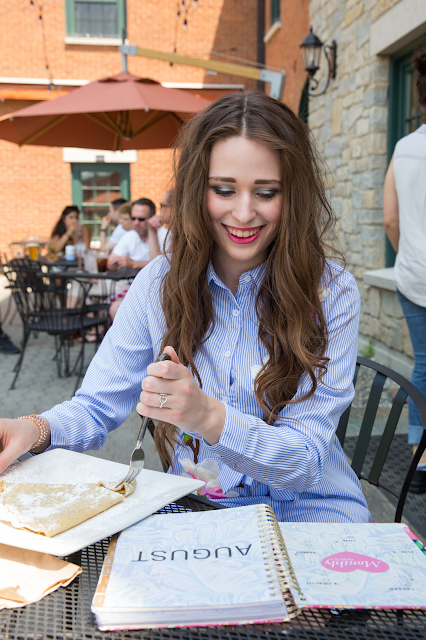 One of my favorite restaurants back in Charlotte was a creperie, so I'm so glad there's a good one here too. Thanks so much for reading! As y'all know I always share my weekly Midweek Ramblings post on Wednesdays... but this week's will actually be going up on Thursday, because I have a special post to share tomorrow! 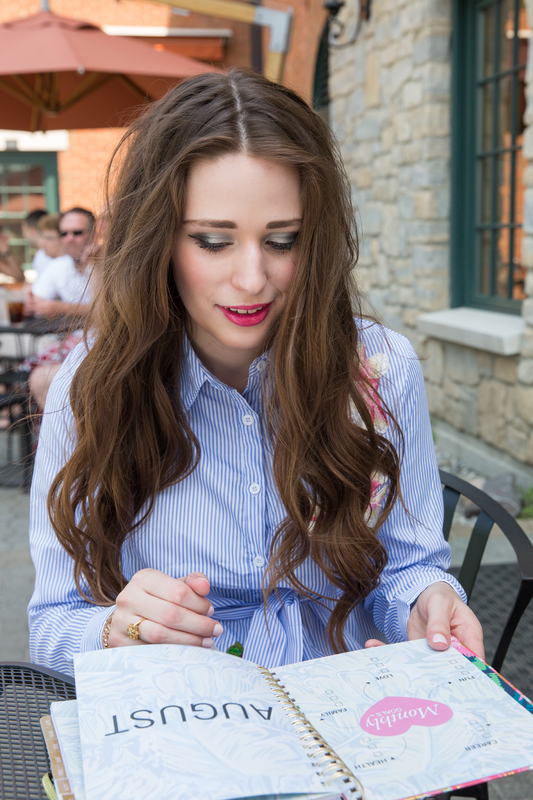 That Lauren James planner is so cute! I love all of her stuff...in fact, I may or may not have just stocked up on a few new tees from a local store that had some of her brand on sale there! Such a cute planner! I love that it has a meal planner feature too, as a college student still learning how to be an adult, lol. This planner is SO cute! Plus, your hair and makeup looks really good in the pics. I love Caitlin from Southern Curls and Pearls, too! She is one of my favorites. That planner is so cute, i love the pattern! One of my favorite things is starting over with a fresh clean planner! I've always got my eye out for new planners! I love the feeling of a fresh slate you get when you fill the pages of a new planner. I've never heard of this one so I'll have to check it out. That planner is so cute! I have the Day Designer and have been loving it in addition to Asana & Trello. I have an addiction to adorable planners and notebooks! And this one sounds amazing, love that they have a meal planning feature! This is so pretty! and it works great throughout the whole year! I don't use a planner yet, but I think I might need it and I'll get this one if I do! Your planner is so cute! I had never heard of this one before! You are the cutest! Love your dress. I also love the meal planning feature on the planner! I have been missing the comfort and pre-made structure of a paper planner. I've been thinking about trading in my Google calendar + bullet journal combo for a traditional planner again, but I can't decide! That planner is so cute! I'm always trying to use my planner, but am terrible with it since I've graduated college!